The blogger who posted photos of hospital meals on the internet, inviting the public to guess the dish, has revealed more about his identity. Amateur Photographer can exclusively reveal that the 47-year-old blogger, who goes under the name ‘Traction Man’, has worked as a journalist in the photography industry. The South West-based blogger, who has declined to be named, has posted pictures of various NHS meals online, asking people to play a game called Hospital Food Bingo. Traction Man says he has spent the past 20 weeks in hospital after being ‘struck down by a bone and flesh-eating bug’. 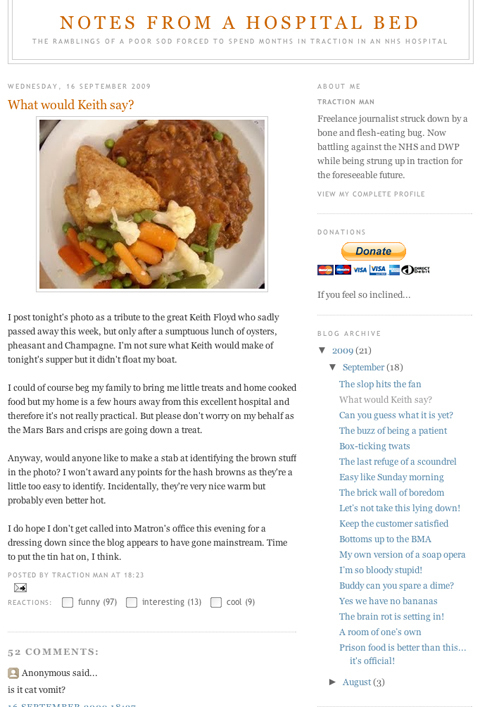 The patient’s review of hospital cuisine has made headlines worldwide. Writing in his blog earlier this week, Traction Man posted one photo ‘as a tribute’ to the legendary TV chef Keith Floyd, who died on Monday. ‘I’m not sure what Keith would make of tonight’s supper but it didn’t float my boat,’ he wrote.